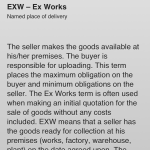 Need to quickly reference the 2010 (or 2000) Incoterms on your mobile phone without Internet access? No problem! My Incoterms App gives you offline access to the 2010 Incoterms, the 2000 Incoterms (for past reference), and an Allocation of Cost chart to take with you wherever you go. Full-text search filter makes finding the correct term a snap. 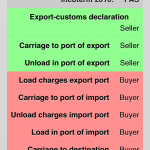 Plus My Incoterms is the only iOS app to have the Incoterms cost allocation cart – making it a must have for anyone writing or interpreting international sales contracts. Sales contracts for logistics and shipping are often different depending on the laws of the respective countries. This causes international legal disputes that waste both time and money. In an effort to minimize this, the International Chamber of Commerce (ICC) developed a set of terms to be used internationally to interpret local policy in sales contracts. These are known as Incoterms. They have historically been updated every 10 years to stay up-to-date on new shipping policies and changes in the world. 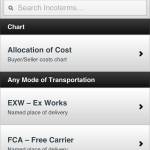 This app contains that list and other useful information related to Incoterms.